Bob, my brother, finished putting the trim around the eaves and soffit of the pumphouse today. In the photos I posted last week, some of that trim was missing. So here’s a new photo with all the trim in place. 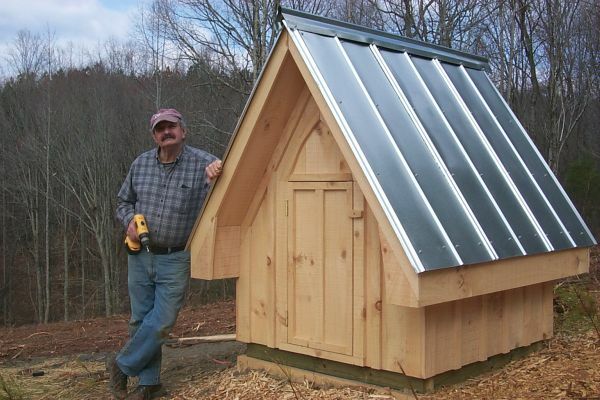 Bob with the finished pumphouse. Notice that what Bob calls “the birds,” the facing on the soffit, has a slight gothic curve, as does the trim over the door. We’ll use these same themes on the wellhouse, which I plan to start early next month. I’ll let the wood cure a bit, then I’ll apply some sort of preserving finish on the white pine siding. I’m not yet sure what that finish should be, but to me the right answer is — whatever they would have used 60 years ago. This was written by daltoni. Posted on Sunday, March 16, 2008, at 11:16 am. Filed under The house, The land. Bookmark the permalink. Follow comments here with the RSS feed. Post a comment or leave a trackback. What is the difference between a pumphouse and a wellhouse? The pumphouse is a small building to house (and keep from freezing) the parts of the water system that aren’t in the well. That includes the pressure tank and the pressure control switch.